Plans for a permanent solution to Operation Stack are to come under the spotlight for a second time as part of a public consultation that will get underway next week. The government recently announced that it would implement a contra-flow system along the M20 between Junction 8 and 9 as an interim measure in the face of possible delays when Brexit takes effect.Now Highways England is to invite views on finding a permanent solution – for the second time – which could involve one or more lorry parks to prevent the M20 being closed completely when delays happen.A six-week “listening exercise” will take place from next week, with a series of exhibitions and meetings across the county.These will be the start of a longer-term consultation process aimed at identifying permanent improvements to how freight traffic is managed when there is disruption to cross channel services in future. People will be asked whether they would prefer to have an on-road or off-road lorry holding area; or a combination of both on either single or multiple sites. The government has emphasised that it has no sites in mind for lorry parks and is open-minded about its options. But it says the consultation will seek views on whether everyday 24-hour lorry parking should be considered as part of a lorry park solution. Approximately 900 lorries park illegally or inappropriately across Kent each day. “The disruption that people in Kent experienced in the summer of 2015 underlined the need for improvements to how traffic is managed when services across the English Channel are interrupted. “We now have an opportunity to take a completely fresh look at what a permanent solution to Operation Stack could be, and understanding people’s views will be vital in making sure we can identify the most appropriate outcome. The government was forced to scrap a planned lorry park off the M20 near Folkestone last year ahead of a Judicial Review. 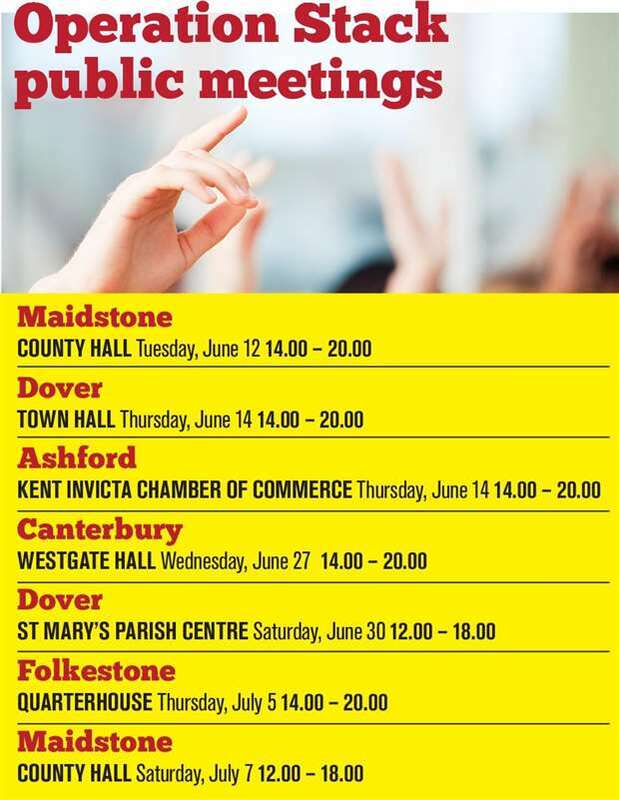 All meetings to take place from 2pm to 8pm except Dover and Maidstone when the times are 12noon to 6pm. Next Sham, Tick-a-box Consultation 20th June.